Earth is on fire. The consequence of global development run amok powered by the unbridled use of fossil fuels is being felt worldwide as wild fires burn out of control. The images and news stories are horrific but if the climate scientists are correct with their long term predictions, what is happening in 2018 is merely a taste of what is to come. It would seem at this time, that the droughts and wildfires are not catastrophic enough to warrant action to stop the use of fossil fuels for energy. If anything, developed nations which are most culpable for climate change are showing that short term economics is more important than what might happen thirty years from now. The tatters of the much celebrated Paris Agreement is being swept under the carpet as billions of dollars are being spent on fossil fuel subsidies. Even the poster boy of climate change fighters, California state, where wildfires and drought are increasingly becoming a threat to its economy is ignoring the signs and continues to explore for fossil fuels. The New York Times piece on climate change “Losing Earth: The Decade We Almost Stopped Climate Change” is good for wishing that governments would have done something back then but as witnesses to the failure to stop the addiction to fossil fuels, the next thirty years is even scarier. 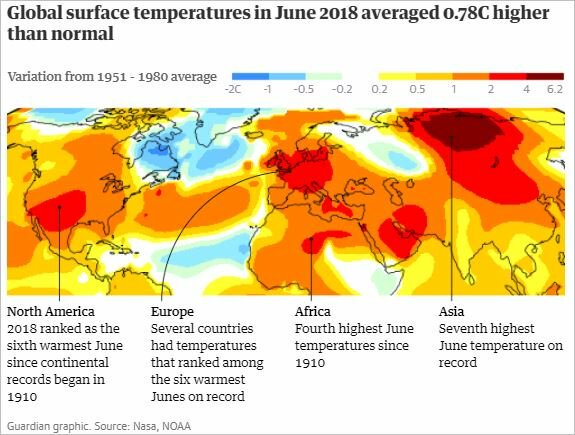 There is no denying that the “fossil fuel lobbyists and corrupt scientists” are to blame for what is happening in 2018. The doubts they casted on alternate fuel sources, especially in the transport sector which accounts for an average of 25% of global emissions, continues to hobble the biofuels industry. The use of food or crop based energy will lead to higher food prices. There are numerous arguments both for and against this claim but what is undeniable today is the immediate threat to food supplies from fossil fueled droughts. Farming systems and crops can change to meet the needs for food and fuel whereas crude oil is capable of only one thing. Adding to global emissions. That the reduced use of biofuels will lead to the preservation of forests in tropical countries. Africa is presently not a supply source for biofuels but deforestation due to multiple other causes is continuing to erase its forest cover. This approach is also carbon colonialism in its extreme as it assumes that poor tropical countries especially those in Africa will be content with simple forest lifestyles while developed countries continue to exploit the continent for fossil fuels. "ILUC is not measurable, as it takes place via complex economic interactions and is manifested only in small variations in the large dynamics of the global agriculture system. It can only be analysed through detailed modelling." The premier certification scheme to ensure that any biofuels used in the EU does not contain or cause deforestation also says that ILUC cannot be observed but only modelled. If ILUC is neither measurable nor seen, why is it in the words of Ron Kotrba, being allowed to drive public policy on biofuels? "If EU target policies (RED and FQD) will be abandoned in the EU transport sector, then it should be expected that the role of biofuels will decrease, with significant negative consequences on the contribution of transport to total greenhouse gas emissions and increasing risk of failing the renewable energy targets." With all the factual knowledge of the potential green house gas savings available from biofuels, there are no excuses to explore its wider use instead of limiting it over the cheap convenience of fossil fuels. Pseudoscience cannot be used to exclude a source of energy which can be cultivated and controlled with technology to become the greenest possible source of energy.